Sometimes I get projects that’re more complex than usual. Sometimes these projects use more than one of the services I offer. Sometimes they pretty much use all of them. 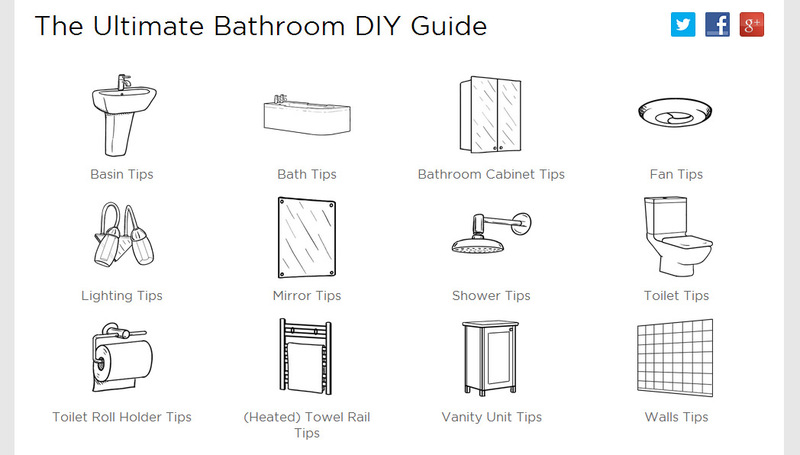 That’s been the case for the Bathrooms.com Ultimate Bathroom DIY Guide. 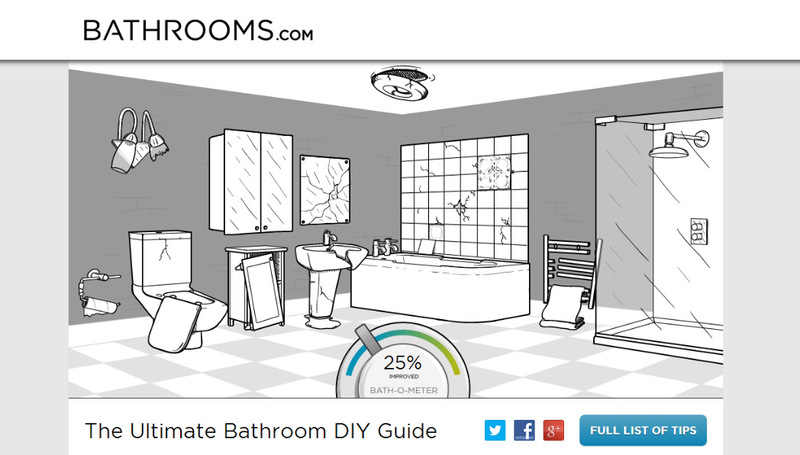 Bathrooms.com wanted to further boost their online enagement, so Dynamo PR proposed a web-based interactive guide, which would curate the best bathroom maintenance tips from the Internet to help people enhance and repair their bathroom. Dynamo PR commissioned me to design, illustrate and develop the guide. What? Some of us like drawing baths. Once created, I recorded and voiced the “How To” video to take users through the usage of the guide. 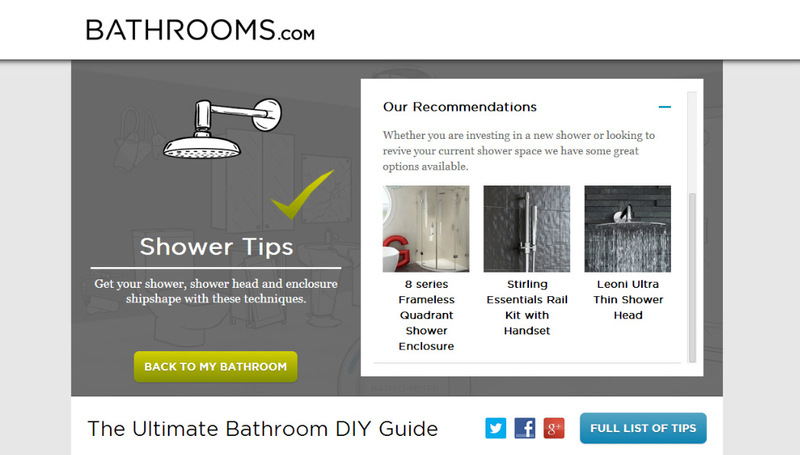 Bathrooms.com and Dynamo PR were delighted with the end results, and hopefully many people will benefit from the one-stop-shop of DIY tips. Have a play now and please feel free to share it: www.bathrooms.com/ultimate-bathroom-diy-guide. If you’re looking have a high quality interactive web-based app created then I’d love to work with you on it. Please get in touch! This week I was given an interesting creative task: to enhance MiiPC’s social media branding to reflect the fun, safe nature of the MiiPC, along with highlighting the wide range of games on the platform. MiiPC, if you don’t know, is pretty cool. It’s a funky looking, Android-based PC that has safety for kids and parental control built in alongside a wide range of great apps and games. You kind find out more about it here. I was commissioned by long time partners and all-round-awesome PR agency Dynamo PR to sort out the social branding. Rather excitingly, tonight and tomorrow I’m hosting a couple of radio shows on Heat Radio: the #1 station for music and celebrity across the UK! Hi. How’re you doing, Blogging hub? PLEASE, PLEASE CAN YOU MAKE “POPULAR POSTS” AVAILABLE AS A FEED? This might sound more like a rant having spent hours trying to source a decent way to resolve this, resorting to simply not using thumbnails at all (if you look at The Custard TV home page, you’ll see why 50x50px thumbnails really wouldn’t work). It might sound like a rant. P.S. On the plus side, Blogger, you’ve definitely evolved: I’ve managed to get the Custard TV site looking like a non-Blogger site, in particular the home page, all thanks to your flexibility in terms of template manipulation through HTML and CSS. So… thanks! P.P.S. It’s not odd to be addressing my posts to blogging websites, is it? P.P.P.S. Actually, given Google’s latest hardware, perhaps I should tip my head up and address you as “OK, Blogger” instead. Firstly, my apologies for the delay in this blog post. My hosting provider (UK2) had a major data corruption issue last week, which left my site down for several days. Fortunately all is good now (touch wood) so it should (touch wood) stay stable (touch wood) from now on (touch wood). Secondly, alongside placing my hands on bark, I’ve been rather cheery in my demeanour following last week’s Adobe Games Design Course award. Here, finally, is my post talking all about it. Each week there was live session online with the course leaders, featuring game theory, game programming tutorials and a weekly speaker from the games industry. It gave a great insight into the principles behind making great computer games, what it’s like to actually work in the games industry (and the various paths to get into it), plus how to design and develop our own games. During the 10 weeks, we were given a weekly assignment to incrementally develop a particular game (“RoboCat”), designed by course leader Mark Shufflebottom. Each week we were given the opportunity to add to what Mark had guided us through (I won a weekly award based on my redesign of the look and feel of the game), and then at the end of the course we had to create our own game – based largely or in part on the RoboCat game. The result of three days of solid game development was Quibble’s Quest: a scrolling platformer / shooter around 3 levels, with the object being to destroy all baddies on a level and get to the exit in the lowest possible time. You can read more about the game in this previous post. 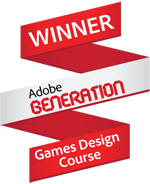 The award was for Overall Excellence (Over 19 (only just, mind…)) in the Adobe Generation Games Design course, based on my final game! I was absolutely chuffed and surprised by this, as the quality of the other games was damned good! I’m thrilled to have won! The latest version is playable here (more details on what’s changed in it since the awards on a future blog post). Well, following winning this award I am going to take the bull by the horns and focus on getting my skills and experience in games increased, alongside my portfolio. Next steps include redeveloping this website you’re looking at to better reflect this, learning lots of technical things (today and tomorrow I’m on the Creative JS course, run by the excellent Seb Lee-Delisle) and creating many more games (I have something for Christmas planned). 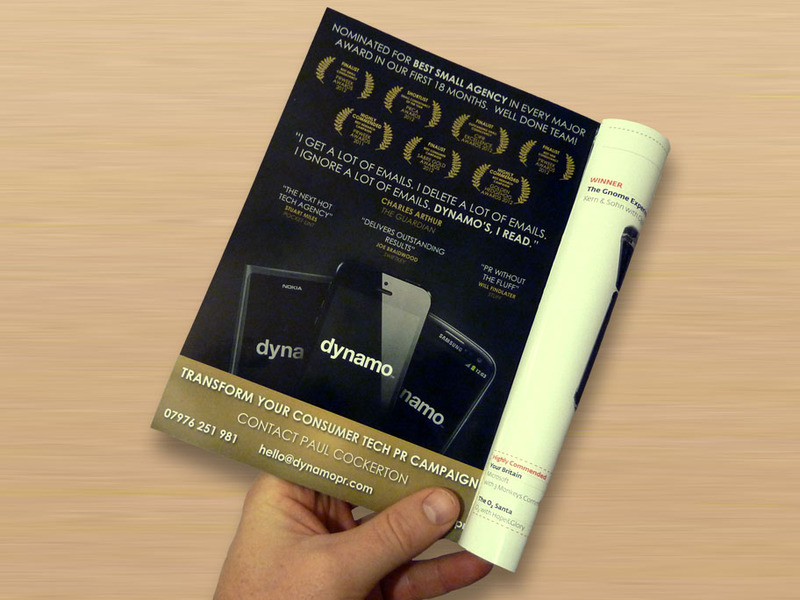 Dynamo PR – An Advert! I’m good here, ta, in fact I’m still pretty chuffed through getting my first advert design printed. Oh yes. 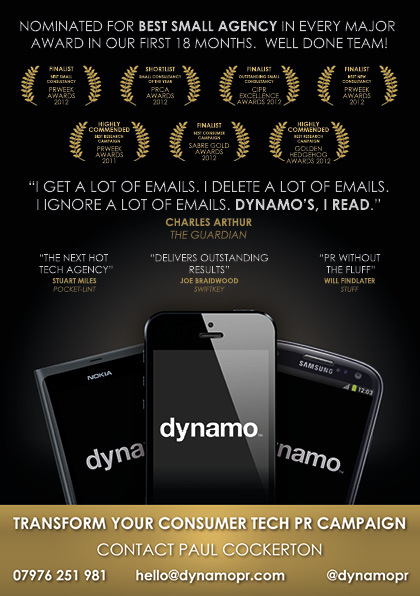 It was for the brilliant tech PR agency Dynamo PR, to display in the national PRWeek Awards brochure (as seen by various PR agencies and their clients across the UK). Well, this is a turn up for the books (pun intended): I’ve been commissioned to be the voice of the Burly and Grum children’s books by their highly talented author Kate Tenbeth. These books chronicle the journey of Burlington “Burly” Bear and Grum the Groblin, from their initial (rather bumpy) meeting through their search for a secret city (with help of their friend Max the human boy) to… well, I won’t spoil it. I am, frankly, both excited and faintly terrified – this being my first official step into the world of audio book recording – and cannot wait to really get behind the characters themselves as I read through the excellent three existing books. If you know me well, you’ll know that character voices is something I do, but it’s normally not really designed for kid’s books… (Hallooo, pets! (Quiet, Gemma)). All three Burly and Grum books are available on the web site here! experience for kids to visit – more on that as it happens. P.S. The new Pat Scullion web site is coming soon… with plenty more of my portfolio to browse, demos to listen to, things to buy and giraffes to pet. Less of the last one. Blimey, long time no speak. I must admit that I’ve been rather neglectful of my lovely lil’ blog for a while. Well, that’s going to change now, with at least one update a week so you can see what I’ve been up to, and what sort of interesting things I’ve been finding. Last Thursday I was invited to the press launch of the excellent Georgie: the smartphone app for the blind. It was quite a fun thing to be a part of as there was a real buzz around the place. Also, the lunch we were treated to is… well… I’ve never had anything like it. We ate lunch in a restaurant named Dans Le Noir in London, which is dark. Not just quite dark. Really dark. Pitch black, in fact. Through black-out curtains and a lack of windows you literally cannot see a thing in the room. The restaurant’s waiters are all blind, and they help you to your seat at your table, whereupon you have a careful feel around on the table in front of you to discover where things are. You’re then served drinks, food etc as normal – except you’ve no idea what’s being brought to you until you taste it. * I can’t speak for the table, though. That place was probably a bomb site after I left it. The Georgie application runs on pretty much any Android device and allows you to do all sorts – from finding out when the next bus at the nearby bus stop is, to warning you that there’s a low hanging branch a few metres up ahead of you as you’re walking around. The latter is a particularly strong feature for people who have limited or no sight: when you’re out and about, you can record voice memos relevant to that place that will be played back to you on returning. But that’s just the tip of the iceberg. It can do a lot of things! The interface itself is clear, bold and simple, using an audio and vibration feedback method and involving a tap-to-hear, press-and-hold-to-select system. You can find out more on the Georgie Application Site. I was invited as I’d designed the logo and branding for the Georgie (and Screenreader) application (on behalf of the brilliant Dynamo PR). I’m looking forward to seeing the Georgie application take off over the coming months!